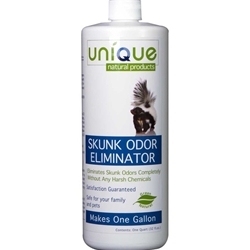 Do not apply sanitizers or disinfectants on surface 6 hours before or after treatment with Skunk Odor Eliminator. This is a concentrated product, which means you can mix it 3 to 1. For best results, mix with warm water (plus, who wants a cold bath!). For this product to work properly it must be mixed with water. NOTE: Once product has been diluted it must be used within 7 days, so dilute only the amount you will need. Soak in solution for 15 to 20 minutes then let air dry. Let air dry.